Canon Genuine Camera Housing Leaks ! For a number of years there have been issues with the Canon range of underwater cases, causing random floods or sometimes just small persistent leaks with what appears to be a perfectly good housing - often they are even new housings that have leaked on the first submersion! 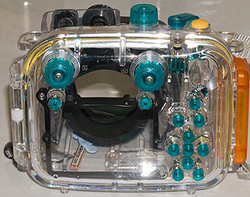 Now to set the records straight, I am not suggesting that I know more than Canon do about underwater camera housing design, nor am I suggesting that these housings are inferior. I am just stating simple facts about fixing a simple problem, that obviously has slipped past the quality control people at the Canon underwater housing factory. The fix is easy, and can be carried-out by the end user (please don't e-mail me to ask if I can fix your housing). I have no commercial reasoning to include this information on my website, other than the fact that I answer e-mails daily from people asking for more details or photos of how to fix their housing. The information I am providing is not guaranteeing to fix your housing, but it ceratinly will not cause a leak if you follow the instructions closely. Then, in most cases, the leak will be fixed. I have had quite a few people bring Canon Compact Housings to me for help over the last few years, as they have had small leaks for no apparent reason. These housings started with the G7, G9, G10, A610, A620, A630, A640, A710, A720 models, but now have extended to the G11 & G12 Housing's. I have so far not seen a problem with the genuine G15 & G16 Housings. Maybe, just maybe ... someone at Canon has been checking their production ? 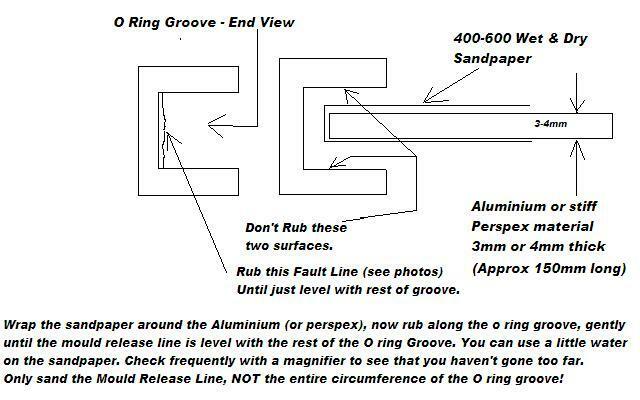 What I have found on close inspection is that there are four (4) Mold Release Lines (or spelt "mould" if you come from the USA) in the main 'o' ring groove on the door. These 'lines' run across the groove and very obviously would stop the 'o' ring seating in the groove correctly. It seems that most people have leaks in the shallows with their Canon housings. Either on descending or after a deeper dive with no problem, a leak is evident as they ascend into the last 10 meters. This is typical of an 'o' ring that has not seated correctly, so that's why I started looking closer. I had one desperate photographer who wanted me to try anything to have their housing fixed. So I promised to find the leak source. It was a Canon G9 housing, I could see the water entering the housing as a very small drip that ran down the 'O' Ring until it pooled at the bottom. I could see and feel the Mold Release Line, so decided to sand the Mold Release line, as this was exactly where the drip eminated from. I used a piece of very fine wet&dry abrasive sand paper (600 grit or higher - but not lower), I wrapped a small piece around a small aluminium ruler (about 2mm thick), then gently sanded the mould release line, until it was level with the bottom of the groove. I actually did the sanding a step at a time and inspected the progress with a magnifying glass and progressed until the Mold Release Line was finally non-existent and the 'O' Ring groove had a flat bottom, rather than a step at the Mold Release Line. It was quite easy to see the problem with a magnifying glass before sanding, and that it was smooth after the sanding. I also sanded the other three Mold Release Lines in this particular housing, as they also were raised more than they should be. After sanding I also polished the 'O' Ring groove with some car polish to remove the small scuff marks caused by the sandpaper. I was so confident that I had fixed the problem, I took the housing with its camera on a dive immediately after fixing it, and it was dry as a bone.... which it hadn't been for quite a few prior dives. It has since proved to be perfectly sealed and hasn’t leaked since. Check-out your own housing if it has these Mold Release Lines AND GET IT FIXED PRETTY -SOON! FOOTNOTE: I have now fixed more (lots) of Canon Housings and all have been successful. I have also just fixed a G12 housing that leaked on its first dive, it had exactly the same problem. It also explains to me why some Canon housings leak and some don't. This mould release line is often more evident in some housings than others. The housings I have inspected that haven't ever leaked, have very low or indistinct Mold Release Lines, hence the reason they haven't leaked. If you would like to read more about caring for your housing, please visit the DivePhotoGuide website where I have written an article on basic housing maintenance. The Mold Release Lines are shown here with Red Arrows. There are two more at the opposite end of this section of the housing also. This is a close-up photo of one Mold Release Line, you can see the line runs across the 'O' Ring Groove and continues (harmlessly) up the outside of the housing rear door. It is only where it crosses the 'O' Ring Groove that it is a problem.